Tip: you can follow this tutorial with the flowchart editor using example project: Sugar crystallization! 2nd: Define components and densities! 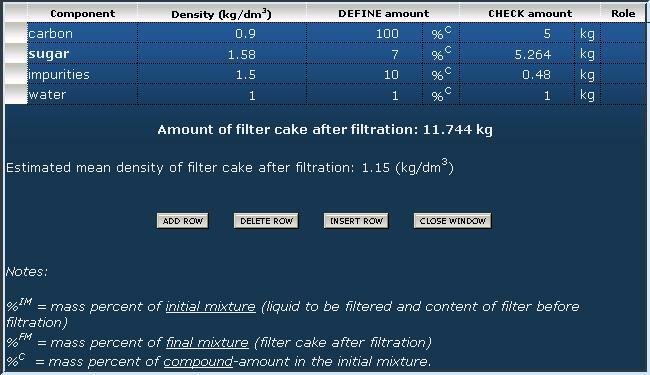 Since the material flow calculations operate in mass unit (kg) and the recipe could contain volumetric data (litre) setting the correct density values of each component is definitely necessary. Click on the composition field of an input material (right end of each row) to access the composition editor table. The program automatically defines 1 component with a default name and a default density value (1 kg/dm3) for each input material. Clicking on the default compound name a drop-down list must be appear. define new compound : adds a new compound to the list with an automatic generated name. rename this compound : lets you give a custom name to the current selected compound (in this case: "compound-02"). delete this compound : deletes current selected compound - not only from this list, but from the entire project. After choosing this function the current selected compound will disappear from the compound selectors and drop-down lists. This is useful for eliminating unused compounds, in order to "clean" the compound selector drop-down lists. The further options are selectable compounds. (I.e. : the entire current compound list of this project.) Note: The program inhibits multiple compound selections. 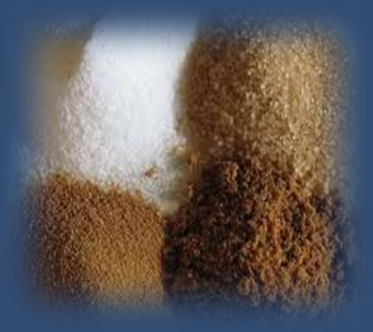 rename "compound-02" to "sugar", and enter a density value of 1.58 kg/dm3 to it. add new row to the table, and click on the [select component] field. choose (for example) "compound-05" from the list. rename "compound-05" to "impurities", and enter a density value of 1.5 kg/dm3 to it. set amount of component "impurities" to 6 mass percent. Please notice that percentage values are normalized automatically to a sum of 100%. Select the row of the "sugar" component and click on the [MARK AS COMPOUND OF INTEREST] button. The name of this compound became bold. This type of marking hepls the program creating more consistent flowchart. now go on with the compound definition of the further input materials (activated carbon and ethanol). Mark: short symbol for identification. This is used in the operations table and on the flowchart. Name: description of device, could be a bit longer. Appears only on the technological flowsheet. Type: a classification in connection with operations this equipment is for. E.g. for a filtration you can select only an equipment of a filter-character type or for a drying process only dryers can be selected. The purpose of this kind of restriction is to help editors being consequent. After definitions of materials and equipment you can switch to the [Operations] worksheet and edit each operation step by step according to the recipe. Dissolve 80 kg crude sugar in 100 litres of water, and clarify it with 5 kg of activated carbon. Use the "load" operation to get your materials into the process to be simulated. Please notice that the program enables for "load" only input materials. Note that there is no need for defining a "dissolution" or "homogenization" operation since the program handles the actual content of a vessel as a homogenous mixture. In other words: the program does not distinguish solid and liquid and gaseous components. So "dissolution" of a material means simply "loading of it". Filter off the hot mixture, i.e. separate activated carbon and adsorbed impurites from the sugar solution. This means we have to define some component separation. First enter a "filtration" operation into the next row, and set the appropriate manufacturing devices (see picture below). Then set a transfer amount of 100 % of content of the "clarifier" vessel (see picture below). As you can see, there is 2 [EDIT] buttons in the "Details" field (at the end of row). The first button belongs to the "filtered material", and the second one to the "filtrate". Both buttons can be used alternatively for set components to be separated. These settings are complementary definitions, i.e. if components staying on the filter are set, this setting determines the composition of the filtrate, too, and vice versa. The component editor table is very similar to that of the materials table, but this is a little bit more complex. In this case there are 2 composition columns: one for defining amounts, and one for checking amounts in another units. Moreover various percentage units can be used, explanation of them can be found on the bottom of the table. After closing the component editor table the amounts in the main operations table are refreshing (in this case: amount of filtered material and the filtrate). 5th: Generate technological flowsheet and summarize material amounts! Swith to the [Flowsheet] worksheet to see the generated material flow diagram. You can export this figure by clicking on the [PRINT] button. Swith to the [Materials] table to see the summarized amounts. You can export this table by clicking on the [PRINT] button.